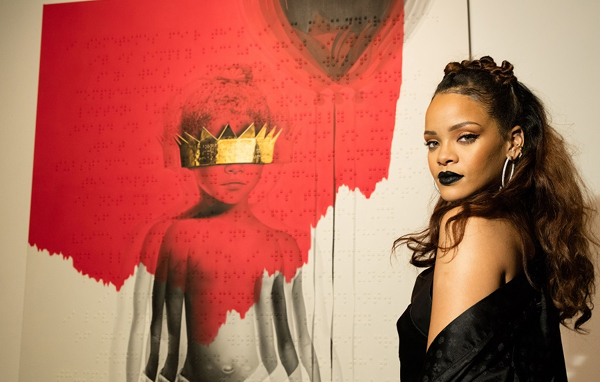 Last week, Rihanna’s Anti, which was released a few weeks ago, finally landed at the top spot on the Billboard 200. Thanks to the soaring airplay of “Work,” Rihanna’s latest album is sitting on top of the world. Good news for Ri, certainly. But when you examine the number you get a very different revelation about a much-speculated music industry. The album has moved 54,000 equivalent units; that includes how many times the album has been streamed on streaming services like Spotify and Tidal. When broken down to only look at physical and digital copy sales, the disc only sold 17,000 copies last week. And that granted her a spot at the top of the Billboard 200 because it was the most an album sold that week. This will also mean that last week’s numbers on Anti was the lowest sales figure for a number one album ever. In light of Adele’s 25, a breakthrough album that hit number one and sold millions without any streaming services jumping on it, this news about Anti isn’t welcoming. 17,000 in the U.S? If this is the new standard for the music industry, it’s a very devastating one. If sales continue to suffer, Billboard might need to rethink the way they generate their weekly charts. Because it seems disingenuous and deceiving on the surface. The album may have been played a few thousand times on streaming services, but that will also mean that Rihanna’s paycheck from those services will be embarrassing. Not only that, those plays were never purchased, only borrowed. It’s not even in the same category of a cheap DVD being pulled from a RedBox to only be returned for the next patron. We all should know that streaming services like Spotify pays very little to artists. According to 2015 figures, Spotify’s average rate per play stands at .00408 for those who holds the master rights of a song. And here’s a little more turbulent news for ya regarding Ri’s newest record. When Anti was first released in early February, Nielsen Soundscan orginally reported that the album sold fewer than 1,000 copies in the US (460 copies to be precise), where it opened at number 27 — Ri’s lowest opening chart position to date. So good luck, Ri, on cashing that big check this week. Time to go to werk, werk, werk, weerk! Literally.